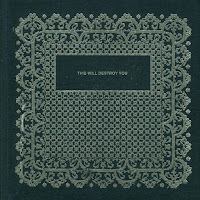 This Will Destroy You’s sophomore effort, quite appropriately self-titled, is undoubtedly a step forward for the band which superbly paid homage to its post-rock predecessors in 2006 with the demo-turned-debut Young Mountain. Now, with a couple more years of touring and songwriting under their belts, the band seems to have matured greatly, building upon their strengths and entering into 2008 with brand new monster of an album that they can truly call their own. Evidence of the band’s growth is abundant in this self-titled release, though the underlying personality of their traditional sound is still quite present. From beginning to end, there is a lot to like about this album. Every sonic layer is incorporated in a deliberate and effective fashion, while taking time to let passages develop to their full potential, often lingering reflectively when necessary. The band also seems to have perfected their use of electronic percussion and effects, which provide a wonderful accent to the glowing guitar harmonies and seamless transitions without becoming overbearing or distracting at all. The album’s opening track, “A Three-Legged Workhorse” shows off what is perhaps the most original addition to the album—a magnificently textural electronic beat slowly fading in amidst the thick fog of feedback, which gently falls away just in time for the epic ensemble to do their work. Above and beyond the obvious technical maturity, there is a clear sense of patience on this album, which has undoubtedly come solely with experience. While some songs do adhere to the typical “post-rock formula,” others dwell on smaller musical niches, proving that TWDY can still create killer tracks without the need for always including predictable build-ups, massive crescendos, or sometimes even any percussion at all; the 7-minute ambient passage “Villa Del Refugio” is a surprising but pleasing testament to this. Still, tracks like “Threads” provide just enough familiar structure to hold everything together, and are no less breathtaking than the rest. As with many instrumental releases these days, there isn’t any one single feature that makes or breaks this album—it’s more about the overall aesthetic. It is the ability of the band to know just how much is really enough without going overboard; their acute sense of harmony and emotion, which lifts this album out of the cluttered pile of “pretty good” and onto the pedestal of amazing. Since their first appearance, This Will Destroy You has continued to set itself apart by getting so right what so many other post-rock bands get so wrong. Their music, then and now, exhibits compassion, emotional complexity, stylistic innovation, and above all, sheer talent. While many groups think they can get by with just some expensive effects and simplistic melodies, these guys invest what seems like their entire souls into creating truly captivating instrumental passages. If there is any group today who can lead the post-rock genre to new heights, it is undoubtedly This Will Destroy You. This is probably my favourite post rock album so far. I always end up going back to it no matter how many other bands and songs I delve into. It's nothing short of a masterpiece, a jewel in the sea of post rock.